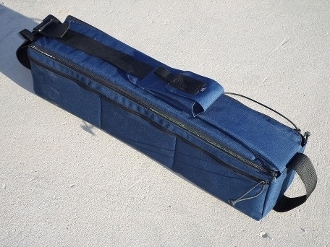 The Cavalry Manufacturing Discreet Rifle Bag is designed for carrying a rifle in non-permissive environments. Fully padded with a configurable internal divider, the Discreet Rifle Bag can carry up to a 20" AR15 broken down and six 30-round magazines. The case works with short barreled AR15s assembled, and folding stock AK-47 style rifles. Internal dimensions are 25.5" Long x 6" Wide x 5.5" deep. The bag has room to stretch/bend in all directions.